5 The radiation-warped mutt descendants of pre-War dogs roam in dangerous packs across the wastelands. Some folks still tame dogs. 10 A few tamed dogs are bred by societies that have been keeping dogs since before the Great War, and these lucky canines have not been so exposed to radiation, nor so changed. 15 The most dangerous mongrels are the alphas of the pack, for they are stronger, tougher, and an alpha's pack rally when it howls. 20 Dogs are wolf-like canids in the genus Canis. There are exceptionally few thoroughbred canines left. Most are complete mongrels. Keen Hearing and Smell. The radstag has advantage on Wisdom (Perception) checks that rely on hearing or smell. Part of the Herd. Radstags gather in herds for mutual protection. A radstag gains a cumulative +1 bonus to Intimidation for every other radstag within 15 feet of it. Multiattack.The radstag makes two attacks with its bite. It must attack either the same target twice or two targets within 5 feet of each other. Kick. Melee weapon attack: +3 to hit, reach 5 ft., one target. Hit: 4 (1d6 + 1) bludgeoning damage. Multiattack. The radstag makes two attacks with its bite. It must attack either the same target twice or two targets within 5 feet of each other. Kick. Melee weapon attack: +4 to hit, reach 5 ft., one target. Hit: 5 (1d8 + 1) bludgeoning damage. Herd Tactics. When a melee attack is made against an allied creature within 10 feet of the radstag, the radstag can move to a space adjacent to that target and within the attacker's reach. 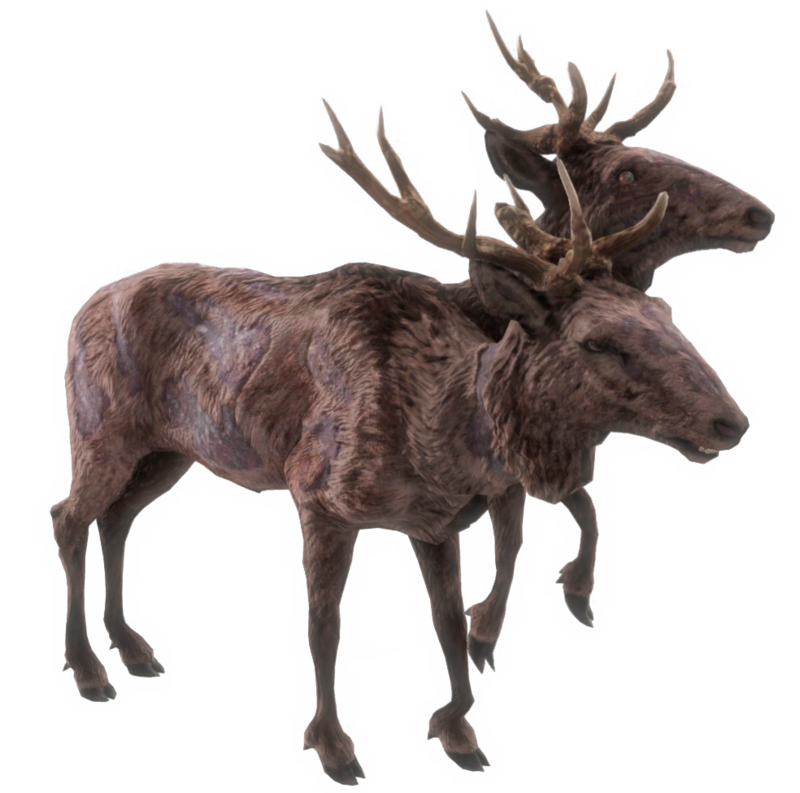 When a ranged attack is made against an allied creature, the radstag can move 10 feet to a space between the attacker and the target. The attacker may choose to redirect their attack to the radstag or continue to attack its original target. Either way, the attack has disadvantage. Charge If the radstag moves at least 20 ft. straight toward a target and then hits it with a gore Attack on the same turn, the target takes an extra 6 (1d12) bludgeoning damage. If the target is a creature, it must succeed on a DC 13 Strength saving throw or be knocked prone. Trample. The radstag's kick attack has advantage and deals an extra 4 (1d8) bludgeoning damage against a prone target. Bite. Melee weapon attack: +5 to hit, reach 5 ft., one target. Hit: 5 (1d6 + 2) piercing damage. Gore. Melee weapon attack: +5 to hit, reach 5 ft., one target. Hit: 8 (1d12 + 2) bludgeoning damage. Kick. Melee weapon attack: +5 to hit, reach 5 ft., one target. Hit: 6 (1d8 + 2) bludgeoning damage. Aggressive. As a bonus action, the rabid radstag can move up to its speed toward a hostile creature that it can see. Charge. If the radstag moves at least 20 ft. straight toward a target and then hits it with a gore Attack on the same turn, the target takes an extra 7 (2d6) bludgeoning damage. If the target is a creature, it must succeed on a DC 13 Strength saving throw or be knocked prone. Trample. The radstag's kick attack has advantage and deals an extra 5 (1d10) bludgeoning damage against a prone target. Multiattack. The radstag makes two attacks with its bite and one with its kick. Its bites must attack either the same target twice or two targets within 5 feet of each other. Bite. Melee weapon attack: +5 to hit, reach 5 ft., one target. Hit: 6 (1d8 + 2) piercing damage, and the target must make a DC 13 Constitution saving throw or be infected with rabies. Gore. Melee weapon attack: +5 to hit, reach 5 ft., one target. Hit: 9 (2d6 + 2) bludgeoning damage. Kick. Melee weapon attack: +5 to hit, reach 5 ft., one target. Hit: 7 (1d10 + 2) bludgeoning damage. Charge. If the radstag moves at least 20 ft. straight toward a target and then hits it with a gore Attack on the same turn, the target takes an extra 7 (2d6) bludgeoning damage. If the target is a creature, it must succeed on a DC 14 Strength saving throw or be knocked prone. Radioactive Aura. A creature that begins its turn within 10 feet of the glowing radstag takes 6 (1d12) radiation damage. Radioactive Glow. The glowing radstag sheds bright light in a 20-foot radius and dim light for an additional 20 feet. Bite. Melee weapon attack: +6 to hit, reach 5 ft., one target. Hit: 6 (1d8 + 2) piercing damage and 9 (2d8) radiation damage. Gore. Melee weapon attack: +6 to hit, reach 5 ft., one target. Hit: 9 (2d6 + 2) bludgeoning damage and 9 (2d8) radiation damage. Kick. Melee weapon attack: +6 to hit, reach 5 ft., one target. Hit: 7 (1d10 + 2) bludgeoning damage and 9 (2d8) radiation damage. Radioactive Aura. A creature that begins its turn within 10 feet of the erratic radstag takes 6 (1d12) radiation damage. Multiattack. The radstag makes two attacks with its bite and two with its kick. Its bites must attack either the same target twice or two targets within 5 feet of each other. Bite. Melee weapon attack: +7 to hit, reach 5 ft., one target. Hit: 7 (1d8 + 3) piercing damage and 4 (1d8) radiation damage. Kick. Melee weapon attack: +7 to hit, reach 5 ft., one target. Hit: 8 (1d10 + 3) bludgeoning damage and 4 (1d8) radiation damage. Charge. If the radstag moves at least 20 ft. straight toward a target and then hits it with a gore Attack on the same turn, the target takes an extra 7 (2d6) bludgeoning damage. If the target is a creature, it must succeed on a DC 16 Strength saving throw or be knocked prone. Gore. Melee weapon attack: +7 to hit, reach 5 ft., one target. Hit: 10 (2d6 + 3) bludgeoning damage and 4 (1d8) radiation damage. Radioactive Glow. The devolved radstag sheds bright light in a 20-foot radius and dim light for an additional 20 feet. Bite. Melee weapon attack: +7 to hit, reach 5 ft., one target. Hit: 7 (1d8 + 3) piercing damage and 9 (2d8) radiation damage. Kick. Melee weapon attack: +7 to hit, reach 5 ft., one target. Hit: 8 (1d10 + 3) bludgeoning damage and 9 (2d8) radiation damage. Charge. If the radstag moves at least 20 ft. straight toward a target and then hits it with a gore Attack on the same turn, the target takes an extra 11 (2d10) bludgeoning damage. If the target is a creature, it must succeed on a DC 16 Strength saving throw or be knocked prone. Multiattack. The radstag makes two attacks with its bite and three with its kick. Its bites must attack either the same target twice or two targets within 5 feet of each other. Gore. Melee weapon attack: +7 to hit, reach 5 ft., one target. Hit: 14 (2d10 + 3) bludgeoning damage and 9 (2d8) radiation damage.